Surfing Heritage & Culture Center: SHOULD I STAY - OR SHOULD I GO? Choose carefully for a moment of hesitation can make all the difference between a successful paddle out, or a rapid return to the beach with a mouthful of salt water and lots of sand imbedded in every opening of your body. That board you so carefully carried down to the waters edge may now be lurking behind the next wave, just waiting for the opportune moment to come ashore and take out everything in it's path. 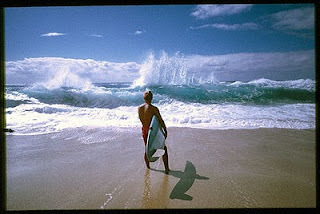 A beautiful moment captured by Dr. Don James circa 1966 Makaha, Hawaii.